Mumbai: Stakeholders in the corporate sector came together to deliberate on the issue of Corporate Social Responsibility at the launch event on Strategic CSR & Sustainability Summit 2017 held at Mumbai. 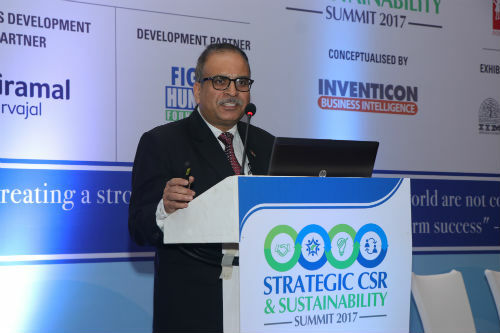 Organized by Inventicon Business Intelligence, the summit served as a platform for CSR professionals to share their insights, interpretations and ideas on paramount topics in the CSR industry. The summit also served as a platform where reputed companies did network, discussed the challenges across the industry and exchanged their ideas and strategies with each other. The two days of the summit witnessed enlightening discussions and presentations on various aspects and trends in reinventing business strategy through incorporating CSR objective in the company’s core business and moving towards sustainability by bringing innovation and building stronger partnerships. Also among the panelists were Anupam Nidhi from Siemens Ltd and Tushar Shankar from United Breweries Ltd. The session was moderated by Madhura Talegaonkar from Bajaj Electricals Ltd. The discussion also threw light on the strategies being implemented in the CSR domain in their companies and other leading companies. The summit also underscored the need to move towards sustainability and create value in the long-run. Anupam Nidhi, Siemens Ltd shared the inspiring CSR initiatives taken by them. Besides the sessions, the day gave an enriching informative experience through a case study by Abhishek Ranjan, Brillio Technologies on the topic ‘Igniting your minds for Digital Tomorrow’, which was followed by two-panel discussions and one more interesting case study by Anurag Kapoor on Schneider Electric India. The summit also witnessed a session on Sustainability Reporting, Climate Change and Creating Shared Value practices from a CSR perspective by Rishi Pathania from United Phosphorus Limited, Shalini Singh from TATA Power and Suresh Vaidyanathan from Alibaba Mobile Business Group respectively. Dr.Nilay Ranjan, Idea Cellular Ltd. carried out a case study on Carbon Footprints; helping boost the country’s ambition to reduce carbon emission, which left the audience enthralled.